Try our satisfaction guarantee - compare our prices and our superior quality. These genuine Zambian emerald earrings are set in 14k white gold leverbacks. This beautiful pair of emerald earrings has fine dark emerald green natural color! These genuine emerald gems are well cut with good brilliance from natural emerald crystals that were mined in Zambia. The gems in these natural emerald earrings have faint natural inclusions (GIA: Type III, Clarity Grade VS). This natural emerald jewelry design is set in solid 14k white gold leverbacks. See a full view of this natural emerald jewelry design. These genuine emerald earrings are set in solid 14k yellow gold studs. This unique pair of emerald earrings has fine medium-dark emerald green natural color. The gems in these genuine emerald earrings have faint natural inclusions (GIA: Type III, Clarity Grade VS). See another view of this unique emerald jewelry design. See also a side view of these genuine emerald earrings. These genuine emerald earrings are set in solid 14k white gold studs. This unique pair of emerald earrings has fine medium-dark emerald green natural color. The gems in these genuine emerald earrings have faint natural inclusions (GIA: Type III, Clarity Grade VS). See another view of this unique emerald jewelry design. See also a side view of these genuine emerald earrings. These genuine emerald earrings are set in 14k yellow gold studs. This pair of emerald earrings has fine medium-dark emerald green natural color. They were faceted from natural emerald crystals that were mined in Brazil. The gems in these genuine Colombian emerald earrings have faint natural inclusions (GIA: Type III, Clarity Grade SI). This natural emerald jewelry design is set in solid 14k gold studs. See a side view of these genuine Brazilian emerald earrings. These genuine emerald earrings are set in solid 14k yellow gold studs. This beautiful pair of emerald earrings has fine medium dark natural color. These fine color emerald gems are very well faceted from natural emerald crystals that were mined in Colombia. The gems in these natural Colombian emerald earrings have faint natural inclusions (GIA: Type III, Clarity Grade VS). These genuine Colombian emerald earrings are set in solid 14k white gold studs. This unique pair of emerald earrings has nice medium-dark green natural color. These beautiful emerald gems were faceted from natural emerald crystals that were mined in Colombia. The gems in these natural Colombian emerald earrings have faint natural inclusions (GIA: Type III, Clarity Grade SI/VS). These genuine emerald earrings are set in 14k yellow gold studs with very fine Zambian emerald gemstones. 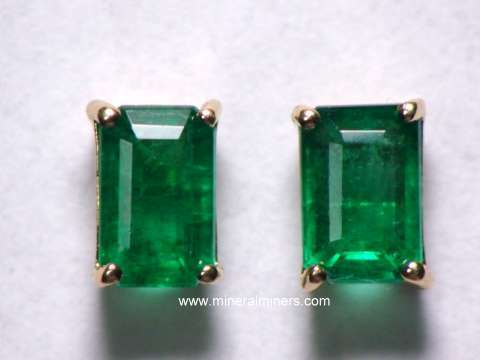 These natural emerald gems are well cut with good brilliance, and they have very fine dark emerald green natural color! The gems in this pair of genuine emerald earrings were faceted from natural emerald crystals that were mined in Zambia. These lightly included emerald gemstones have faintly visible natural inclusions (GIA: Type III Gems, Clarity Grade: VS). These genuine emerald earrings are set in 14k yellow gold studs. These natural emerald gems are well cut, and they have very fine dark emerald green natural color! The gems in this pair of genuine emerald earrings were faceted from natural emerald crystals that were mined in Zambia! These superior quality emerald gemstones have faintly visible natural inclusions (GIA: Type III Gems, Clarity Grade: VS/SI). Faceted by hand from natural Colombian emeralds! This natural color emerald necklace was hand-crafted from emerald crystals that were mined in Colombia. These gem quality emeralds were shaped into small rounded, disk shaped beads which were then faceted, drilled and strung in this 19" long genuine emerald necklace with a sterling silver clasp. These transparent emerald beads are lightly included to eye clean with light to medium emerald green natural color. The beads are gradational in size ranging from 2.25mm at the clasp up to 4mm at the largest diameter in the center of the necklace, and then back down to 2.25mm again. There are 33 carats of gem-grade emerald beads in this beautiful emerald necklace! The photo at left shows a close-up view. See also a full view photo of this genuine Colombian emerald necklace. This is our finest grade transparent Colombian emerald necklace with fine medium-dark emerald green natural color faceted emerald beads! This rare quality emerald necklace was hand-crafted from natural emeralds with fine medium-dark emerald green natural color that were mined in Colombia. These gem quality emeralds were shaped into rounded, disk shaped beads which were then faceted, drilled and strung into this 17.75" long genuine emerald necklace with a sterling silver clasp. These transparent emerald beads are lightly included to eye clean, and they are gradational in size ranging from 3mm at the clasp up to 4mm at the largest diameter, and then back down to 3mm again. There are 37 carats of gem-grade natural emerald beads with natural fine medium-dark emerald green color in this beautiful emerald necklace! The photo at left shows a close-up view. See also a full view photo of this natural Colombian emerald necklace. This unique emerald necklace was handcrafted in 925 sterling silver and bezel set with nine medium-dark green translucent Zambian emerald cabochon gems. The cabochons along each side of this unique necklace measuring from 9x8mm up to 14x9mm, and the center gem measures 16x12mm! See a full view photo of this natural emerald cabochon necklace. These are all natural color emerald cabochons, they have not been heated or treated in any way. This genuine emerald with ruby pendant was handcrafted in sterling silver and set with untreared gemstoners of natural ruby and emerald. There are two 7x5mm cabochon gems of natural ruby weighing 2.5 carats total weight, and there are 8 carats total weight of natural emerald cabochon gemstones measuring from 8x6mm up to 10x8mm! The natural ruby cabochon gems are translucent with dark purplish-red natural color, and the natural color light green emerald cabochon gems are semi-transparent to transparent. The photo at left is viewed under incandescent light. These genuine emerald earrings are set in custom 14k yellow gold filigree box style studs with fine quality emerald gemstones. These natural emerald gems are very well faceted with excellent brilliance, and they have very fine dark emerald green natural color. The gems in this pair of genuine emerald earrings were faceted from natural emerald crystals that were mined in Colombia! These superior quality emerald gemstones have very faintly visible (under magnification), natural inclusions (GIA: Type III Gems, Clarity Grade: Clean to the un-aided eye). These genuine emerald earrings are set in custom 14k yellow gold filigree style studs with fine quality emerald gemstones. These natural emerald gems are very well faceted with excellent brilliance, and they have very fine dark emerald green natural color. The gems in this pair of genuine emerald earrings were faceted from natural emerald crystals that were mined in Colombia! Under magnification, these superior quality emerald gemstones have very faintly visible natural inclusions (GIA: Type III Gems, Clarity Grade: Clean to the un-aided eye). This item is in someone's ore cart, please check back. This small size 14k yellow gold emerald pendant is set with a genuine Zambian emerald gemstone with extra fine dark emerald green natural color! 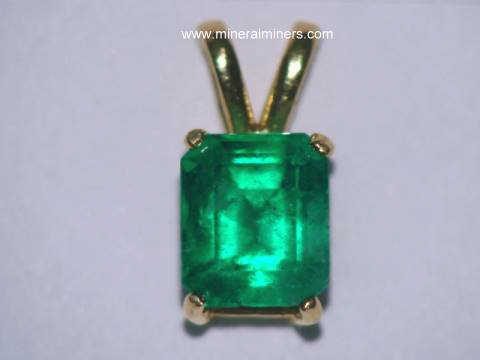 See a side view of this genuine Zambian emerald pendant. This beautiful emerald gem is very well cut in a 4.5mm round shape from a natural emerald crystal that was mined in Zambia. This emerald gem is exceptionally clean with only very faintly visible natural inclusions (GIA: Type III Gem, Clarity Grade: VVS), and it has extra fine dark emerald green color (100% natural color). This natural emerald jewelry design is set in solid 14k gold. This 14k yellow gold emerald pendant is set with an oval shape faceted emerald gemstone that was cut & polished from a natural emerald crystal mined in Colombia. See also a side view of this genuine Colombian emerald jewelry design. This lightly included emerald gem has faintly visible natural inclusions (GIA: Type III Gem, Clarity Grade: SI), and it has medium-dark emerald green natural color with slightly blue-green hues. This natural emerald jewelry design is set in solid 14k yellow gold. This fine emerald pendant was handcrafted in 14k white gold and set with a very beautiful Colombian emerald gem weighing 1.09 carats. This superior quality emerald gem is well cut with good brilliance from a natural emerald crystal that was mined at Muzo, Colombia. See also a side view of this fine Colombian emerald jewelry design. The genuine emerald gemstone in this pendant is lightly included with faint natural inclusions (GIA clarity grade VS), and its color is a fine medium-dark emerald green natural color. This unique emerald pendant was handcrafted in 14k white gold and set with an emerald cut Colombian emerald gem weighing 2.64 carats. This beautiful emerald gem has superior brilliance. It was faceted from a natural emerald crystal that was mined at Muzo, Colombia. See also another view of this natural color Colombian emerald jewelry design. The genuine emerald gemstone in this pendant is lightly included with faintly visible natural inclusions (GIA clarity grade VS/SI), and its color is a fine medium-dark emerald green natural color. This unique emerald pendant was handcrafted in 14k white gold and set with an emerald cut Colombian emerald gem weighing 1.59 carats. This superior quality emerald gem is well cut with good brilliance from a natural emerald crystal that was mined at Muzo, Colombia. See also another view of this natural color Colombian emerald necklace design. The genuine emerald gemstone in this pendant is lightly included with faintly visible natural inclusions (GIA clarity grade VS), and its color is a fine medium-dark emerald green natural color. This 14k yellow gold emerald pendant is set with a triangular faceted emerald gemstone that was cut & polished from a natural emerald crystal mined in Colombia. See also a side view of this genuine Colombian emerald jewelry design. This lightly included emerald gem has faintly visible natural inclusions (GIA: Type III Gem, Clarity Grade: VS), and it has medium-dark emerald green natural color with slightly blue-green hues. This natural emerald jewelry design is set in solid 14k yellow gold. This unique emerald pendant is set in 14k yellow gold with a large pear shape Colombian emerald gem weighing 2.56 carats. This beautiful emerald gem was faceted from a natural emerald crystal that was mined at Muzo, Colombia. See a side view of this genuine Colombian emerald jewelry design. The large emerald gemstone in this pendant is lightly included with some faint natural inclusions (GIA: Type III Gem, Clarity Grade VS), and its color is a fine medium-dark emerald green natural color. See also another view of this natural color Colombian emerald 14k necklace design. This emerald pendant was handcrafted in 14k yellow gold and set with a beautiful Colombian emerald gem weighing 1.93 carats. This superior quality emerald gem is well cut with good brilliance from a natural emerald crystal that was mined at Muzo, Colombia. See also a side view of this Colombian emerald jewelry design. The genuine emerald gemstone in this pendant is lightly included with faint natural inclusions (GIA clarity grade VS), and its color is a fine medium-dark emerald green natural color. This fine emerald pendant was handcrafted in 14k yellow gold and set with a genuine Colombian emerald gem weighing 1.38 carats. This superior quality emerald gem is well cut with very good brilliance from a natural emerald crystal that was mined at Muzo, Colombia. 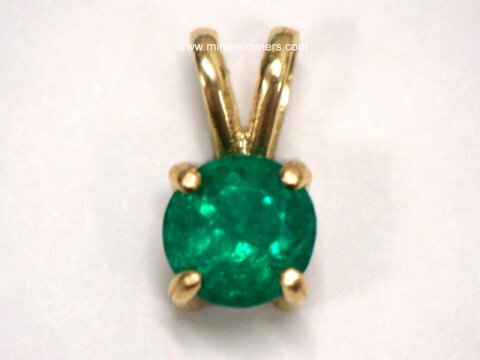 See also a side view of this fine Colombian emerald 14k gold pendant. The genuine emerald gemstone in this pendant is lightly included with faint natural inclusions (GIA clarity grade VS), and its color is a fine medium-dark emerald green natural color. This natural emerald pendant was handcrafted in 14k yellow gold and set with a genuine Colombian emerald gem weighing 1.13 carats. This superior quality emerald gem is well cut with very good brilliance from a natural emerald crystal that was mined at Muzo, Colombia. See also a side view of this extra fine Colombian emerald pendant. The genuine emerald gemstone in this pendant is lightly included with faint natural inclusions (GIA clarity grade VS), and its color is an extra fine dark emerald green natural color. Natural emerald pieces that were mined in Brazil were tumbled and polished in baroque shapes, and then drilled and strung in this 18" (45cm) genuine emerald necklace with a sterling silver clasp. These emerald beads are translucent to semi-transparent, with a light to medium tone of natural emerald green color. There are approximately 220 baroque shaped emerald beads in each of these natural emerald necklaces. The photo at left shows a close-up view. 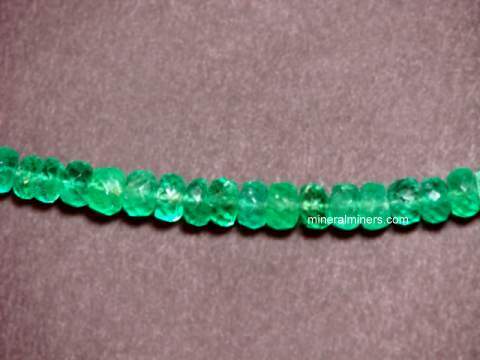 See also a full view photo of this 18 inch long genuine emerald necklace. You can see our entire inventory of tumble-polished natural gemstone bead necklaces available in a wide variety of natural gem materials. Natural emerald pieces mined in Brazil were tumbled and polished in free-form shapes, and then drilled and strung in this 36" (91cm) "endless" genuine emerald necklace. These emerald beads are translucent to semi-transparent, with a light to medium tone of natural emerald green color. See a full view photo of this natural emerald necklace. There are approximately 400 baroque shaped emerald beads in each of these natural emerald necklaces! The photo at left shows a close-up view. See also another full view photo showing this genuine emerald necklace doubled up. This natural color light blue-green emerald necklace was hand-crafted from emerald crystals that were mined in Colombia. These semi-transparent emeralds were shaped into rounded, disk shaped beads which were then faceted, drilled and strung in this 18 inch long natural emerald necklace including a one inch long sterling silver extender chain and clasp. The beads are lightly included with light blue-green natural color, and they are gradational in size ranging from 3mm at the clasp up to 5mm at the largest diameter in the center of the necklace, and then back down to 3mm again. There are 45 carats of genuine emerald beads in this Colombian emerald necklace! The photo at left shows a close-up view. See also a full view photo of this genuine Colombian emerald necklace. We also have faceted bead necklaces available in genuine tanzanite necklaces. This unique emerald pendant was handcrafted in 925 sterling silver and set with a 9x7mm semi-transparent oval faceted Zambian emerald gem weighing 1.7 carats. See also a side view photo of this natural Zambian emerald pendant. This unique emerald pendant was handcrafted in 925 sterling silver and set with a 10x7mm thin semi-transparent rough piece of genuine Zambian emerald with very fine natural color. This unique emerald pendant was handcrafted in 925 sterling silver and set with a 14x9mm translucent rough piece of genuine Zambian emerald with very fine natural color. The backside of this thin emerald piece was sawn flat and it has a rough upper surface. This pair of genuine emerald gemstones has very fine natural color. They have a very rich dark tone of slightly bluish-green. These emerald gems were faceted from a natural emerald crystal that was mined in Zambia. These superior quality emerald gems face up with faint natural inclusions that are just slightly eye visible (GIA: Type III Gem, Clarity Grade VS), and they show no evidence of any treatments. They are well cut with very good brilliance. 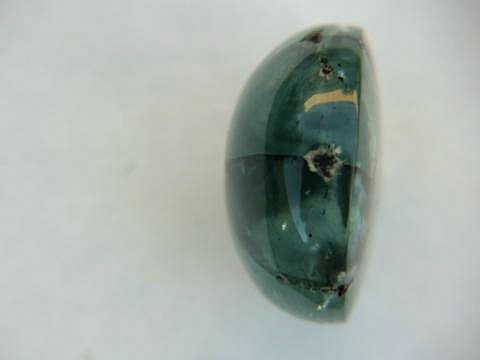 These fine quality cabochon gems of naturalTrapiche variety emerald have a very beautiful medium dark tone of slightly green color that is 100% natural (no evidence of treatments of any kind were detected on theses gems - they are completely natural and untreated). These gems were hand crafted from a single natural trapiche emerald crystal that was mined at the Muzo mines, Colombia. Trapiche Emerald cabochons are not common, and these fine quality trapiche gems have very good color, fairly good spokes and transparency throughout with not too many eye visible inclusions other than the desired black trapiche spokes. This quality of trapiche emerald is very difficult to find, especially in matching pairs, and should be in some ones serious collection or set up in ear-rings.The top view photo at left was taken at a slight angle to show some depth. See also a photo of emerald gemstone looking through the gems with difused lighting at the back. At this time, we are offering these matching gems at a special offer price of $3251.00 for the pair. 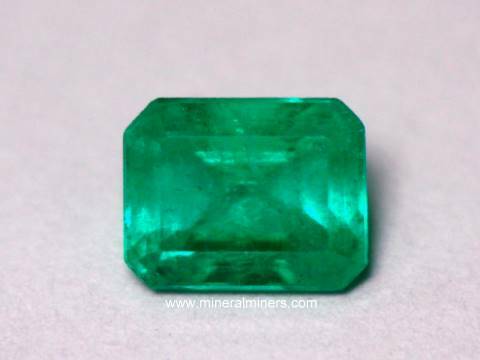 This rare gem of naturalTrapiche variety emerald has a medium lite tone of slightly bluish-green color that is 100% natural (no evidence of treatments of any kind were detected on this gem - it is completely natural and untreated). This gem was hand crafted from a natural trapiche emerald crystal that was mined at the Muzo emerald mine in Colombia. Trapiche emeralds are fairly rare, however this good quality very large trapiche gem with uniform spokes and good transparency throughout with only moderate eye visible inclusions other than the desired black trapiche spokes is scarce. Each pie shaped section in this gem contains a small amount of chatoyancy resulting in a slight cats-eye effect. This size and overall quality of trapiche emerald is very dificult to find and should belong to a serious collector or a museum. See also a photo looking at an edge view., Also a photo looking at an angle edge view., At this time, we are offering this collector gem at a very special offer price of $300.00/carat = $10,770. This emerald is a medium tone of green. The gem has minor inclusions that can be seen with the unaided eye. Emerald is considered a class III gemstone in GIA nomenclature. With the somewhat noticeable inclusions, this gem would be considered VS under the class III GIA grading system. The faceting proportions were not optimum and the stone does show what is known in the trade as a "window" (see-through effect). This beautiful emerald is an excellent value at only $589.05 total price. This rectangular shaped emerald gem has a beautiful medium tone of fine natural emerald green color. See also a side view of this natural Colombian emerald gemstone. This lightly included emerald gem (GIA clarity rating VVS for Type III Gem) has faintly visible natural inclusions, and it has good brilliance and with no black inclusions. This exceptionally clean emerald was cut in Brazil from emerald rough mined in Brazil. Although this gem shows no evidence of oiling, we assume all Brazilian emerald rough to be oiled. The gemstone was very nicely faceted in the classical Emerald Cut. The color of this emerald is a nice crisp, very slightly bluish green of medium tone, with no easily visible inclusions. As emerald is considered a class III gemstone in GIA nomenclature, this gemstone would be considered VVS (GIA clarity grade). See a side angle photo of this natural emerald gemstone. See a side view photo of this natural emerald gemstone. See an upside down photo of this natural emerald gemstone. See another view photo of this natural emerald gemstone. 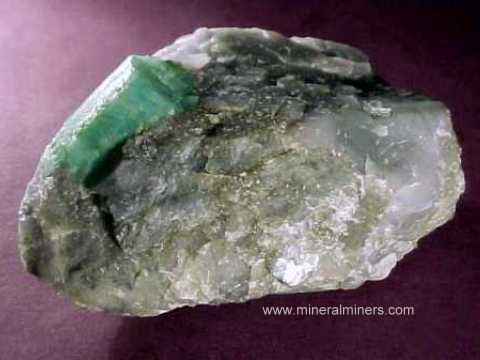 See another view photo of this natural emerald gemstone See another view photo of this natural emerald gemstone Mineralminers price on this gem is $700 p/ct. Total price is $952.00. This rectangular shaped emerald gem has a beautiful medium dark tone of fine natural green. This lightly included emerald gem (GIA clarity rating SI for Type III Gem) has visible natural inclusions, and it was well cut with a good face up size. It was faceted from a natural emerald crystal that was mined in Minas Gerais Brazil. It is assumed in the Trade that all emeralds mined in Brazil have been oiled for possible improved appearance. This rectangular shaped emerald gem has a beautiful medium dark to dark tone of fine natural green. This lightly included emerald gem (GIA clarity rating SI for Type III Gem) has visible natural inclusions, and it was well cut with good proportions. It was faceted from a natural emerald crystal that was mined in Minas Gerais Brazil. It is assumed in the Trade that all emeralds mined in Brazil have been oiled for possible improved appearance. This rectangular shaped emerald gem has a beautiful medium tone of fine natural green. This nearly clean emerald gem (GIA clarity rating VS for Type III Gem) has no easily visible inclusions. It does have some natural inclusions visible under magnification. It was well cut with a very nice brilliance. It was faceted from a natural emerald crystal that was mined in Minas Gerais Brazil. It is assumed in the Trade that all emeralds mined in Brazil have been oiled for possible improved appearance. This heart shaped emerald gem has a beautiful medium-dark tone of fine natural green. This lightly included emerald gem (GIA clarity rating "slightly included" for Type III Gem) has slightly visible inclusions. It does have natural inclusions, but none of the black specks that are typical of much of the Brazilian production. It is well cut with good proportions. This genuine emerald gemstone was faceted from a natural emerald crystal that was mined in Minas Gerais Brazil. It is assumed in the Trade that all emeralds mined in Brazil have been oiled in the rough for possible improved appearance. This rectangular shaped emerald gem has a beautiful medium-dark tone of fine natural green. This nearly clean emerald gem (GIA clarity rating nearly "eye clean" for Type III Gem) has faintly visible inclusions. It does have some natural inclusions visible under magnification including a couple of minute dark specs. It was well cut with a very nice brilliance. It was faceted from a natural emerald crystal that was mined in Minas Gerais Brazil. It is assumed in the Trade that all emeralds mined in Brazil have been oiled in the rough for possible improved appearance. 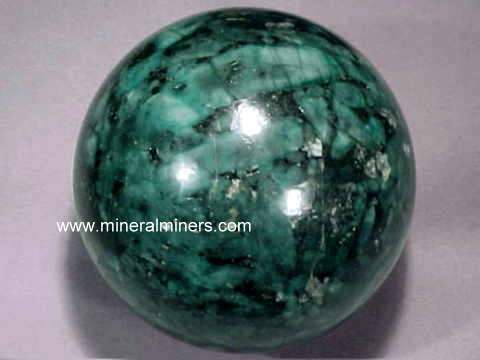 This emerald is a medium dark tone of green. 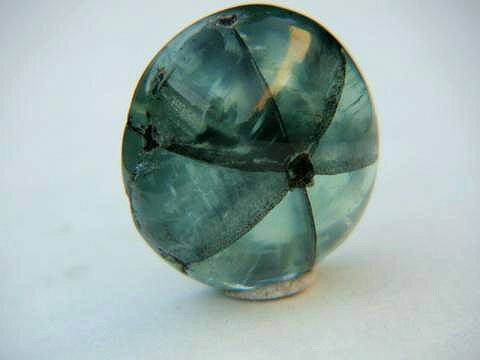 The gem has minor inclusions that can be seen with the unaided eye. Emerald is considered a class III gemstone in GIA nomenclature. With the somewhat noticeable inclusions,including a very small pit on the crown facets on one end of the emerald, this gem would be considered slightly to moderately included under the class III GIA grading system. It was faceted from a natural emerald crystal that was mined in Minas Gerais Brazil. It is assumed in the Trade that all emeralds mined in Brazil have been oiled in the rough for possible improved appearance. 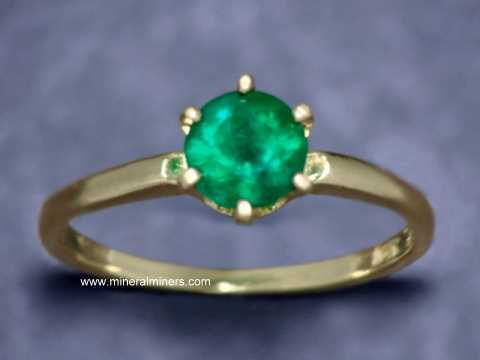 This emerald is an excellent value at only $420.00 total price. This rectangular shaped emerald gem has a beautiful medium dark tone of fine natural green. This nearly clean emerald gem (GIA clarity rating nearly "eye clean" for Type III Gem) has no easily visible inclusions. It does have some faintly visible natural inclusions including a couple of small dark spots, more easily seen under magnification. (as shown at over 5X magnification in the photo at left) It was well cut with a very nice brilliance. It was faceted from a natural emerald crystal that was mined in Minas Gerais Brazil. It is assumed in the Trade that all emeralds mined in Brazil have been oiled in the rough for possible improved appearance. This 2.3 inch diameter emerald in matrix sphere was hand-ground and polished from natural emerald rough mined in Bahia, Brazil. There are emerald crystals exposed here and there all around the surface of this sphere in a dark biotite mica schist matrix. The emerald crystals have light to medium green color. Each of our Emeralds is a genuine emerald! Here at mineralminers.com, we do not have any lab-created emeralds! We specialize in genuine natural emeralds mined in Colombia, Brazil, and in Zambia. See also our page displaying genuine emerald gemstones, as well as our genuine emerald jewelry designs. We also have other natural emerald items in stock including emerald mineral specimens, emerald gemstones, and emerald crystals. 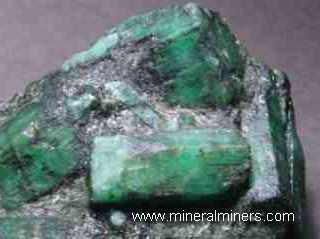 See our natural Emerald Crystals page. 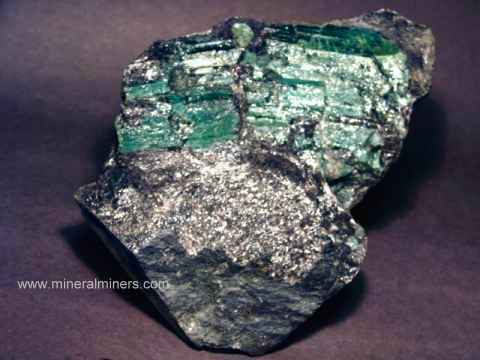 Background information on natural emerald and its physical properties, history, chemistry, geologic occurance, and metaphysical use can be found on our emerald information page. To see more genuine emerald images, just select another link below. To see images of another mineral variety, select any item category link in our Mineral Inventory & Factsheet Index. 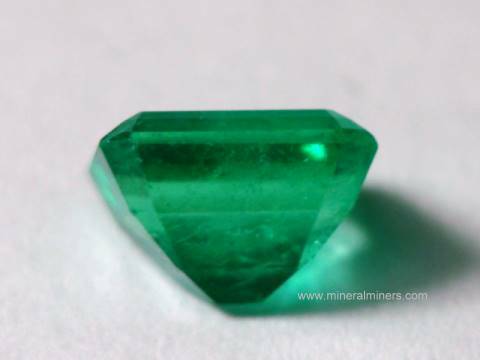 Would you like us to inform you when we add more rare quality items of natural emerald on this page? We do have additional inventory of spectacular natural emerald pieces in stock, so be sure to let us know if you have any rare quality natural emerald special requests. Please contact our webmaster or our 'site' geologist with any questions or comments.